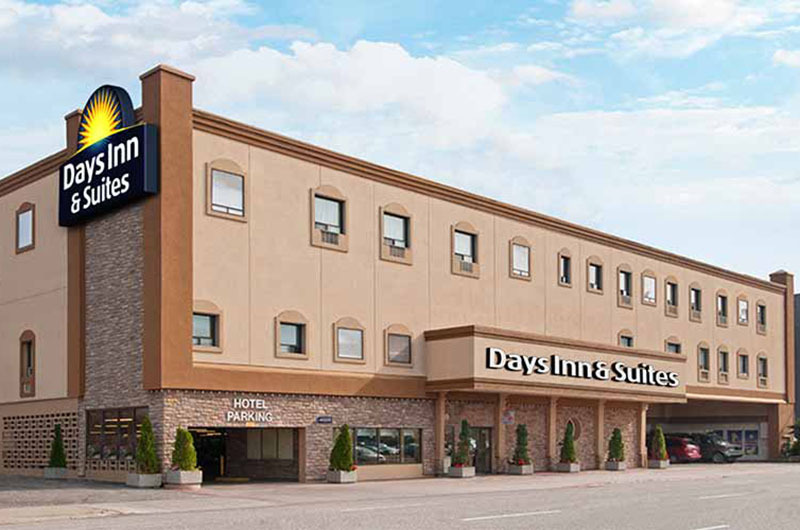 Newly Renovated, Days Inn & Suites is conveniently located steps from the Essar Sports and Entertainment Complex in the heart of downtown, across from the Station Mall shopping centre and boardwalk, we are surrounded by most major attractions, local points of interest and restaurants. On site complimentary Hot Breakfast and secured COVERED parking is available to all registered guests. We are bike and classic car friendly, ask about our wash station. Guest rooms all feature a fridge, microwave, coffee maker, flat screen HD TV’s. Full cooking accommodations and suites are available. Currently offering Wyndham Rewards for qualifying stays. Property has an upgraded exercise room, free high speed and wireless internet acess. Cafe/bakery open from 7am-3 pm daily. Nearby local points of interest include: Soo Locks Canal and St. Mary’s shipping channel, Canadian Bushplane Heritage Center Museum, Ermitinger/Clergue National Historic Site, Sault Ste Marie Museum and Algoma Art Gallary. Local Attractions include: Casino Sault Ste Marie, Treetops Adventures, Searchmont Ski Resort, Agawa Canyon Tour Train, Roberta Bondar Pavilion featuring various outdoor concerts, events and farmers markets. The Days Inn and Suites is conveniently located in the heart of downtown. We are surrounded by most major attractions and quality restaurants, across from the Station mall, Waterfront Boardwalk and the Essar Centre. Just blocks from the casino. All guest rooms are equipped with microwave oven, small refrigerator, coffee maker with complimentary coffee, HD flat screen television, hairdryer, iron and ironing board, high speed internet wireless and direct LAN line. Other complimentary guest services include hot breakfast, covered parking and daily newspaper, local phone calls and, incoming faxes and use of our fitness room. Days Inn and Suites is always prepared to make your stay extremely comfortable and enjoyable from our eco-friendly accommodations to our friendly and efficient staff. Guests traveling with pets are required to stay in smoking rooms. Ask us about upgrading to one of our Whirlpool Rooms or a Junior Suite with air tub.